All Melapur flame retardants are free of halogens, antimony or any other heavy metals. The Melapur flame retardant product range comprises Melapur MC (melamine cyanurate), Melapur MP (melamine phosphate) and Melapur 200 (melamine polyphosphate). 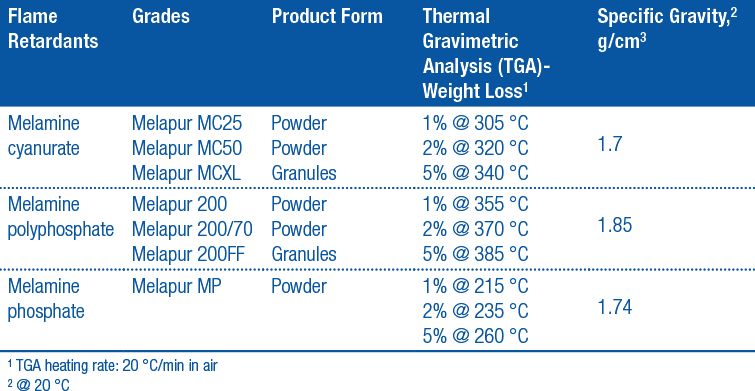 ​The table below demonstrates the considerable advantages of Melapur flame retardants compared to other major flame retardant systems. While Melapur flame retardant is often used as a stand alone, it is also used regularly as an effective synergist with other flame retardants to improve the overall performance of the flame retardant system. Please talk to us for further information regarding these applications and the benefits of Melapur flame retardants in them. ​Melapur MP flame retardant is a salt of melamine and phosphoric acid. Above 200 ºC, it reacts to release water, resulting in a heat sink and leaving the phosphorous component available to react synergistically with other flame retardant components. Therefore, Melapur MP flame retardant is often used in blended flame retardant systems for applications, such as coatings and sealants. Melapur 200 flame retardant decomposes endothermically above 350ºC, acting as a heat sink to cool the polymer. The released phosphoric acid further reacts with the polymer to form a char and inhibit the release of free radical gasses into the oxygen phase. Simultaneously, nitrogen species released from the degradation of melamine intumesces the char to further protect the polymer.